While on an officer exchange mission, Picard crashes on a hostile planet and discovers a woman who has been trapped there for seven years. Meanwhile, Troi and Worf must learn the perils of interspecies diplomatic relations. It's good to see a diplomatic mission that doesn't involve mediating a dispute. How exactly does a species evolve to eat "only for nourishment," find the idea of eating for pleasure alien, and yet still have the brain chemistry to enjoy a chocolate dessert? Worf carving the roast and being "reassured" by Data cracks me up. I forgot how much fun this episode is. Everything on the Iyaaran shuttle is designed with triangles, and if you start looking for them, there are an inordinate number of threes throughout the entire episode. I don't think I'm reading too much into it when I say that the writers must have treated this new alien race as obsessed with the number three. Maybe the writer just read Rendezvous with Rama. It's amazing how every rocky planet in the galaxy has such a smooth, sandy ground to walk on. I'm not sure "a friendly game of poker" is really the best way to calm tension. Then again, maybe Riker suggests it just so he can watch Worf squirm. 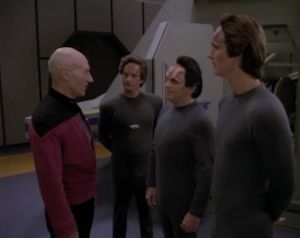 The ambassador with Picard did a really good, detailed job learning Anna's story and figuring out how she should act. Unfortunately, he chose the exact wrong person to try to seduce that way. Picard is pretty quick to forget about the device he built that has a short-lived power cell. This is an especially clever puzzle show that manages to utilize the structure and formula of the episode for its own ends, separating the story into its typical, more serious A-plot and a secondary, more whimsical B-plot. Both stories are connected in ways the audience doesn't fully appreciate until the end, and when it is clarified, it all makes sense. The underlying ideas are also very reminiscent of TOS, with the aliens responsible for all the drama only doing what they're doing out of a genuine curiosity about human nature. Good stuff.